7. Ghyll Singers go Dickensian! 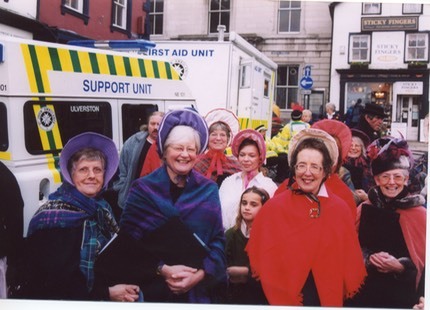 Ulverston's Dickensian Festival takes place in November every year. The ambulances in the background are purely coincidental - there are no records of anyone requiring first aid after hearing us sing! Singing outdoors is never ideal, but it was fun to dress up. Those bonnets are rather fetching, aren't they? Musical Director Stella McKeever (left) looks undecided. Hilary (far right) has reason to laugh, as she's managed to turn up in a stylish cossack-style hat! The bonnets kept the rain off for a while though, so they served a useful purpose!